BOOK REVIEW #6: "RICHARD SCHICKEL'S STEVEN SPIELBERG: A RETROSPECTIVE"
Every movie-goer should know who Steven Spielberg is. He might not be a hot favourite at award ceremonies but his movies normally sell like hot cakes and likely most people on the street would have seen his “E.T.” or “Jurassic Park” at some point of their lives. Written by Richard Schickel, “Steven Spielberg: A Retrospective” is a 280 pages hardcover, coffee table book that give readers a brief insight into every movie Spielberg has directed from his very first feature, “Duel” to the yet to-be-shown locally “Lincoln”. Schickel who is a professional film critic for “Life” and “Time” magazine has complied this book from his numerous interviews with the talented filmmaker. 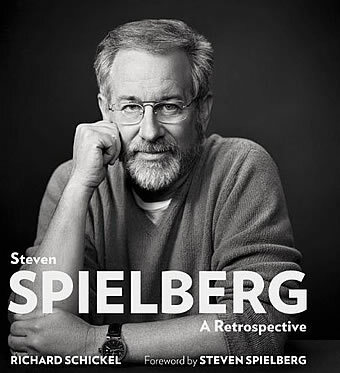 With the exception of a foreword by Spielberg, this book is definitely not a memoir or biographer in fact it bears little of it even though Schickel did devote the first few pages to Spielberg’s childhood days, how the divorce of his parents affected his life and how he kickstart his career at the backlot of Universal Studio. There’s a little bit more on the relationship with his actress/wife Kate Capshaw and family and he say balancing both his loves (the other being making movies) remains his biggest challenge. Probably the best parts came from the subsequent pages as it detailed noteworthy trivia such as the nightmarish process of making “Jaws”, “Always” which didn’t take off in the box-office and why “Saving Private Ryan” is a tribute to Spielberg’s dad. Schickel also suggested that many of his movies reflected the director’s own personality for example “Empire of the Sun”, a much darker movie that advances on two of Spielberg’s major themes – the magic and mystery of flight and the child who is lost and then finds himself. He is also forthcoming with the dissatisfaction over the ending of “Indiana Jones IV” and the failure of “Hook”. Too bad the book did not focus on the countless hit movies he has produced under his Amblin banner over the years say, “Back to the Future” and “Men In Black”. The bearded filmmaker has made over 28 movies as to date and he admits he is still having lots of fun when making “The Adventures of Tintin” despite the hard work and preparation involved. Creatively, this storyteller still has lots to say to the audience and we can’t wait for his official memoir to be written some day. The man who has yet record a commentary track for any of his movies remains an interesting figure. On the whole, “Steven Spielberg: A Retrospective” is a handsome printed book with over 400 photographs and stills that is perfect for movie buffs and fans of Spielberg. On the whole, “Steven Spielberg: A Retrospective” is a handsome printed book with over 400 photographs and stills that is perfect for movie buffs and fans of Spielberg.